Motherhood is wonderful and fulfilling; it’s also occasionally stressful. Sometimes, you need to relax after a tense day. Since you’re a parent, you don’t have an unlimited budget. You want to have some fun without spending a lot of money. Here are four ways for moms to unwind. Sometimes, mothers want to savor the little moments in life. 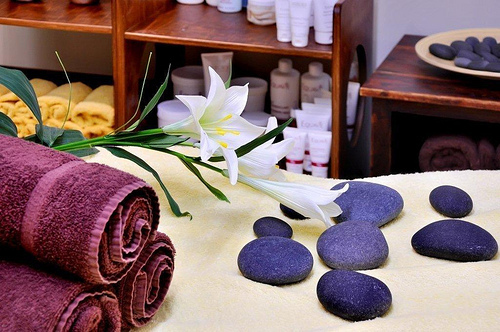 One of the best ways to get away from daily struggles is to spend a day at the spa. It’s the job of the employees there to treat you like royalty. They’ll bring you to a massage table, give you a comfortable blanket, and then rub away your frustration. Of course, spa days aren’t cheap. If you want to go to one on a regular basis, you should look for discounts. Sites like Groupon regularly offer deals. Life is a constant cycle for mothers. You have to worry about what your child eats, and you have to take care of yourself as well. When was the last time you had a meal that didn’t involve chicken nuggets? Sometimes, it’s nice to forget about hot dogs and cheeseburgers. Take this opportunity to order your favorite entree from the nicest restaurant nearby. You deserve a great meal, right? The maxim is true. The best things in life are free. The cheapest way to luxuriate after a long day is to run hot water in your tub, pour in some bubble bath, light some candles, grab a glass of wine, and spend the rest of the evening partially submerged. You may or may not want to read a good book. That’s a personal decision that will depend on your mood. Either way, your bath also provides health benefits. You’ll forget all your problems, and the world will fade away the instant you get in the water. Look out for couponsfrom places like Bath and Body Works for the best bubble baths and lotions. Some of your discounted purchases might even benefit charities. One of the best ways to unwind is by working out. Even if you’re not a huge fan of exercise, this is an idea to explore. Sure, you get a lot of exercise chasing after your kid, but a real workout is different. When you run on the treadmill, do yoga, or bike for a few miles, your body naturally produces endorphins. These chemicals provide a sense of euphoria that will take away all your stress. It’s your body’s way of rewarding you for doing the right thing. Purchasing workout equipment is a better long-term investment than getting a gym membership. You’ll want to choose the exercise devices that you prefer. You also can save a lot of money by finding coupons online for workout equipment at JCPenny, which carries devices you can use at home. If you're in the giving spirit, use your purchases to generate cash for your favorite cause. Motherhood is wonderful, but you need to take care of yourself as well. Follow the suggestions above to unwind for a while. You won’t regret taking the time to focus on yourself.